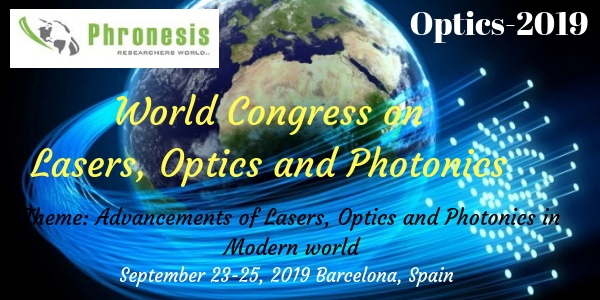 We take pleasure to announce World Congress on Lasers, Optics and Photonics (Optics-2019)” scheduled on September 23-25, 2019 at Barcelona, Spain. Optics-2019 aims to bring together leading academic scientists, researchers and research scholars to exchange and share their experiences and research results on all aspects of Lasers, Photonics, Optics and related fields. Optics 2019 With its strong emphasis on innovative approaches, the conference offers a chance for scientists and Engineers working in different areas of lasers, optics and photonics to learn of the new ideas that could help them to advance their own research and forge new professional relationships and collaborations with the theme of Advancements of Lasers, Optics and Photonics in Modern world. The field of Lasers, Optics and Photonics have not only helped the progress in different fields in science and technology but also contributed towards the improvement of the quality of human life to a great scope. All this has become possible with the different discoveries and inventions leading to the development of various applications. The core aim of Optics 2019 conference is to provide an opportunity for the delegates to meet, interact and exchange new ideas in the various fields of Lasers, Optics and Photonics. New places; new people, Meet network and grow…. The Young Researcher Awards & Best poster awards are part of a global initiative to support early career researchers, with the intention of supporting young researchers in their quest to advance the frontiers of science across a broad range of disciplines. This Award is instituted to recognize and reward young researchers with outstanding track record, a deep commitment to find innovative solutions and potential for high quality research. Submit your abstracts and grab the opportunity!!! Address: Phronesis, LLC, 919 North Market Street , Suite 950 Wilmington, Delaware 19801 USA.